First, the golden ratio is related to a series of numbers: the Fibonacci sequence (0,1,1,2,3,5,8,13,21,34,55,89, …) and the Egyptian archaeologist and Professor Emeritus, Alexander Badawy (1913-1986) proved in his study of more than 50 temples along the Nile that the ancient Egyptians had indeed used this series of numbers on purpose, once again demonstrating their great knowledge and sophistication in architecture. 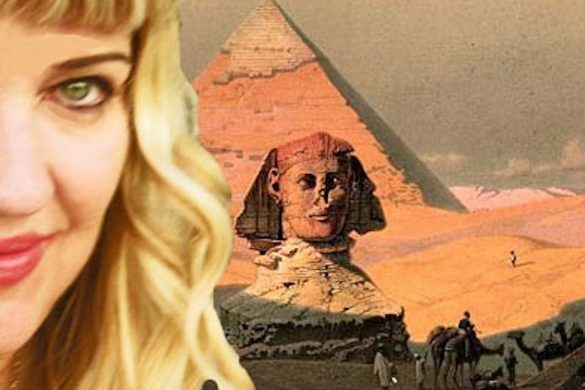 Now I’ll show you in this article that the Sphinx holds many secrets still unknown to most and that our current view of it, is distorted from its original appearance. In 1817, Gianbattista Caviglia** (1770-1845) cleaned the front of the Sphinx, something that had not been done since the fall of the Roman Empire. He first found a fallen piece of the Sphinx’s beard (now at the British Museum), then, cleared of sand, he found an inscription on a toe of the left paw of the Sphinx: 13 lines of text in Greek, engraved conspicuously, with reference to how this is an official documentation dating from 166 AD after the reign of Marcus Aurelius to commemorate the restoration of the walls surrounding the Sphinx by the Romans. This text is exciting and yet one does not have a chance to view it today on the sphinx, as successive restorations – and especially the modern last one -were covered with incredibly thick layers disfiguring the paws of our Sphinx, as stifling as the bandages of mummification. “This structure is the work of the immortal Gods. The reference to Leto*** here is understandable because at the time of the Pharaohs, Ptolemies who were of Greek origin, ruled over Egypt, and Giza was in an administrative district called “Letopolitain“. 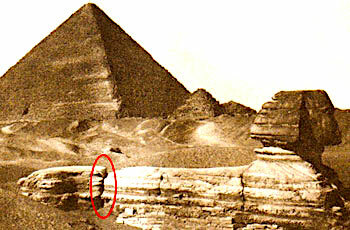 Now there are many references to this throughout ancient Egyptian literature: for example on the altars in the tomb of Tutankhamon in reference to Rostau (Giza), it is cited that its topography is that of water and there is mention of “The house of the lake” regarding the island of the Sphinx. 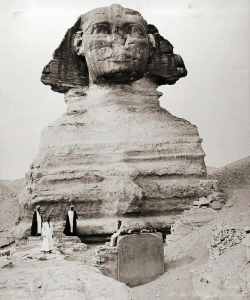 Even Auguste Mariette, who dug around the Sphinx in 1858, admits that the Sphinx enclosure had to contain water of the Nile in ancient times (see references). In the Text of the Sarcophagi, we hear about : the lustral basin, Lake of the Jackal. Why? Quite simply, because of the academic Temple‘s assertion that the Sphinx was originally made in the image of Anubis (“Jackal” is a bad name translation because there have never been jackals in Lower Egypt, but rather wild dogs) the guardian of the site par excellence, and he proves it with forceful analysis, photos and research. 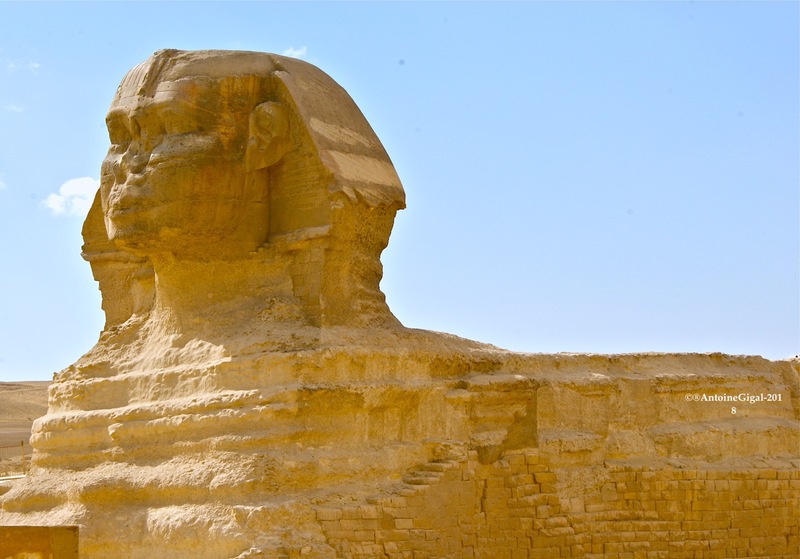 The sphinx would have become leonine towards the Fourth Dynasty when lions were very fashionable in all representations; then the Middle Kingdom Amenemhat II would have affixed this image to his face (and not Cheops). But I will not go into too much detail of the work of Temple here, only a few points here and there. 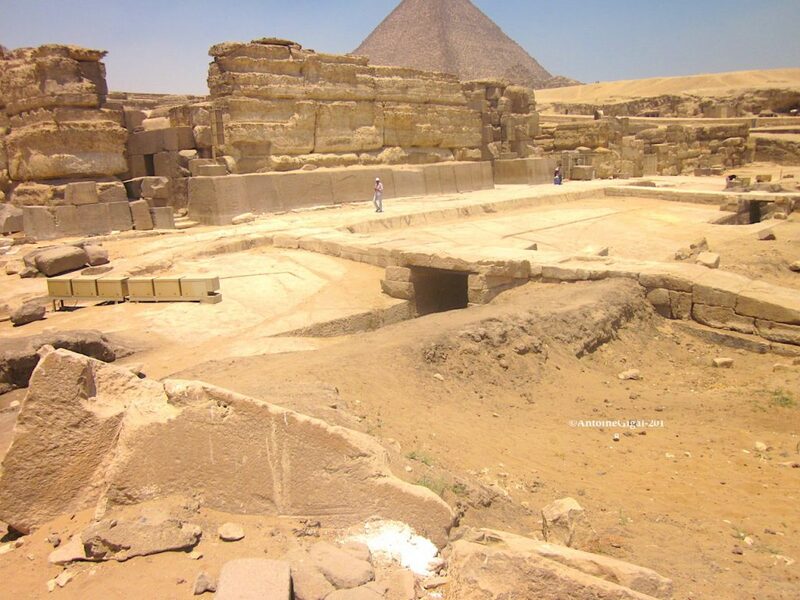 The fact that the original Sphinx could be the representation of Anubis is something I’ve been announcing for years in front of the Sphinx itself to those who accompany me in my tours: showing “in situ” the slope of the back, the tail, signs of erosion from water of the moat. It should be understood that since antiquity the Sphinx has undergone many restorations, the last modern of which consisted of additions of thick courses of ugly and useless stones which only make the contours of the sphinx appear clumsy and without finesse. This is very visible today in the legs, which now look like huge papier-mache bars. We have pictures from the early 19th century and many later photos and after careful analysis we see big differences in the “modern” restorations and successive ones. 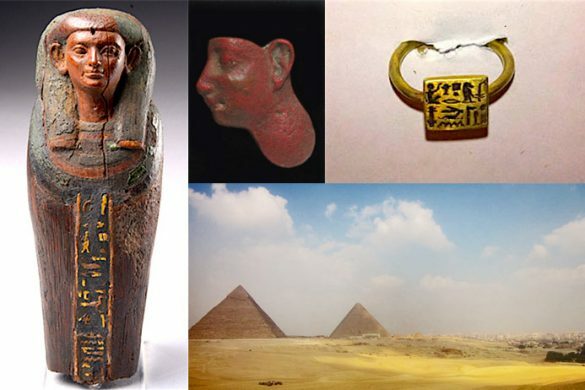 The “Coffin Texts” does not only speak of the lake of the “jackal” (Anubis) but it also mentions: “His name is ‘dog faced’, his size is huge” (verses 1165-1185). Twice in the “Pyramid Texts”, Anubis is cited as being “the height of the West” and the Lake of the “Jackal” is also cited in the book of The Caverns. The outstanding researcher Terence Du Quesne enumerated many references to Anubis “Lord of Rostau (Giza)” in inscriptions and on the walls; he has listed ten sources of this particular title to date. It is only after the fifth dynasty that the title “Lord of Rostau” is given to Osiris. 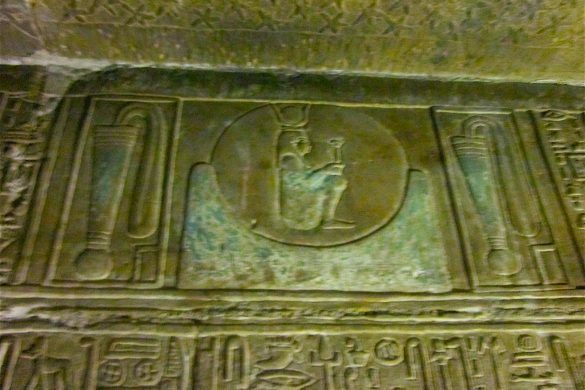 Let us recall that Anubis in Egyptian is “Inpou“, “that which has the shape of dog”; he is also known as “The Way Opener” and guide of the souls and is represented under the name of “Upuaout, path opener” at Abydos in the South. He is also “Lord of the Land of Dawn” and as Rene Lachaud excellently writes: “(…) He brings out the Anubis light of initiation that corresponds to the ambiguous moment ‘between dog and wolf ‘ where day and night interpenetrate.” Also, in “The Book of Going Forth by Day” (which is the real title of The Book “of the Dead”): “Oh! Anubis who is with his secrets. Lord of the secrets of the West. Lord of what is hidden.” That Anubis presides on the Giza plateau is hardly surprising because in Giza/Rostau we are at the crossroads of the greatest mysteries. You’ll quickly understand why. 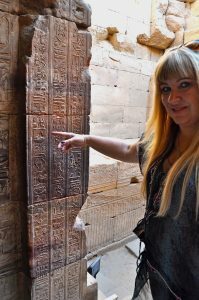 One never speaks to you about the “Book of the Construction“(The Edfu Texts) which is engraved in the enclosure of the Temple of Horus the falcon, in Edfu in southern Egypt. 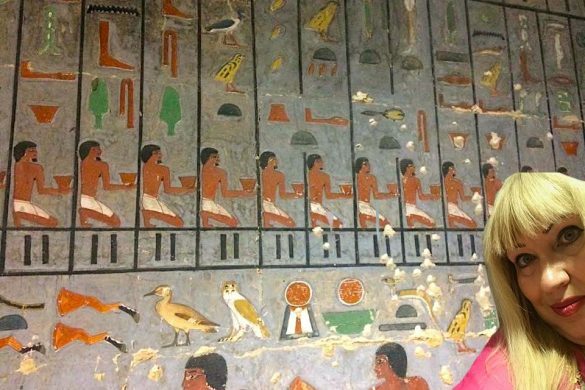 Yet, when you read up on it, it’s inside references to other lost texts like “The Sacred Books of the Temples” that bring together a description of the history of places of pilgrimage along the Nile. And what says this text? It says that these places were established by a group of “creative entities” the “Shebtiw“(look at references) associated with Thoth. It is said that they: also called the “Elders”, the “Falcons“, were installed in a first place on Earth and that this first place is Rostau! I.e. Giza! Also, according to this text, books and sacred objects of power were sealed in a secret place underground by “Shebtiw” and they built over it an immense enclosure and stone masses to protect it. This place is called Bw-HMR, the place of the throne of the soul. In addition, in this text it is always suggested to us that the underground world of Giza is a microcosmic model of the passage of time and the process of the first creation in our physical universe … you understand the Sphinx better now than before; this is not nothing! The ancient Egyptians also named Giza/Rostau in their descriptions: “The Beautiful Place of the First Time” and “The Secret Place” and it is true that the whole Giza plateau that I’ve traveled for 20 years, yard by yard, is packed with thousands of subterranean entries, ventilation shafts and bottomless wells. This all proves the presence of an impressive underground network about which I will on occasion speak more of, in other articles. 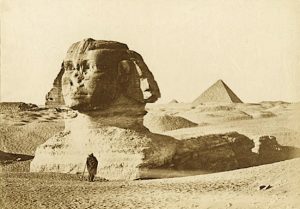 In 1858, the notable Auguste Mariette was commissioned by the Duke of Luynes to verify Pliny the Elder‘s statements regarding that the Sphinx was built and not monolithic. He opened a site near the pyramid attributed to Cheops (who reigned 2551-2528 BC, 4th Dynasty) and in a nearby shrine of Isis, he found the stele called “Inventory” where it says that the sphinx and the great pyramid existed well before the reign of the leaders of the 4th dynasty, before 2575 BC. The text states that: “During the reign of Cheops he ordered the construction of a monument along the Sphinx.” Logically this means that the Sphinx was already there before … But if it was there at the time of Cheops, this means that contrary to what the “mainstream” says, a fortiori, it could not have been built on order of Chephren‘s successor on the throne! 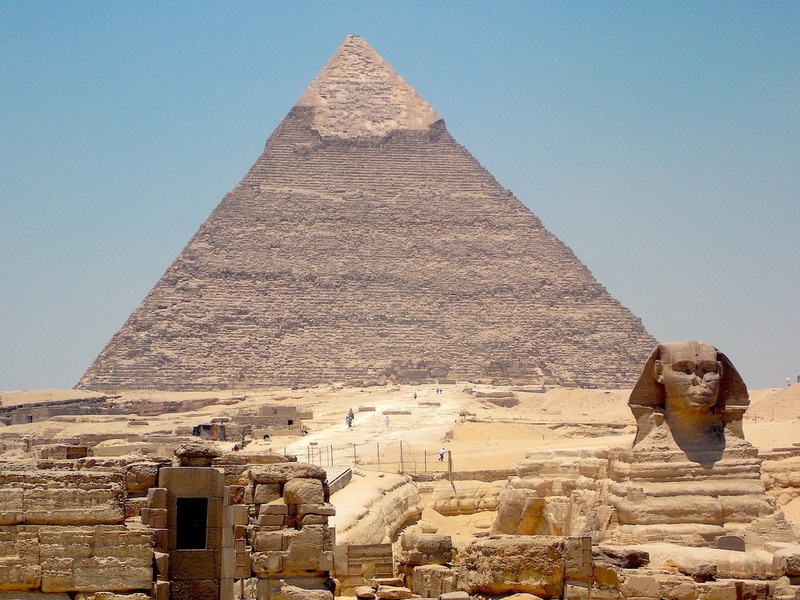 Note that the theory that the Sphinx was built by Chephren – just because the road on its south side leads to the foot of the pyramid of Chephren – was launched without any evidence or knowledge by Caviglia who was still a Master Mariner paid to clear the sand from the Sphinx! No inscription confirms his lightly founded theory. However, if we take this into consideration, all the current chronological dating in Egyptology courses should be re-examined! 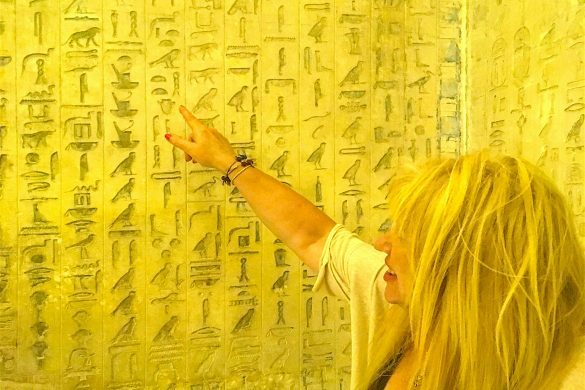 A little too much for some … This is why the majority of Egyptologists today turn away from this stele called the inventory, because it calls into question too many of their achievements. Some also prefer to say that this monument that lists an inventory of the temple of Isis dates back only to the 26th dynasty. 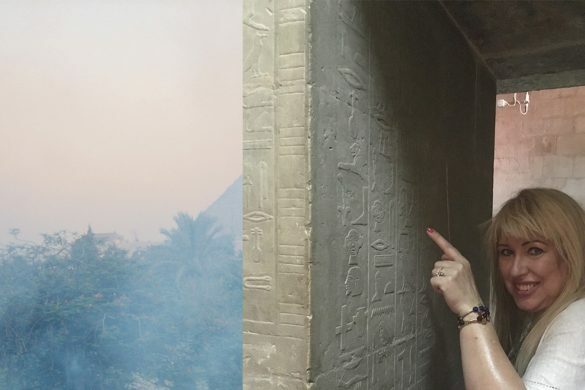 Perhaps, but this is not considering the extensive use of copies of much more ancient texts in Ancient Egypt and the explorer Auguste Mariette, who spent over ten years excavating the Giza plateau, has always said that the stele was erected by Cheops himself. Robert Temple proves this through the study of the coiffe and certain features and also because of the obsession of the Pharaoh Amenemhat II (1929-1892 B.C. ), for the sphinxes. In any case, if the Sphinx originally had a good head of Anubis, and much later it assumed this pharaoh’s head, one could also surmise that others before Amenemhat II could have also affixed their face, the head of the sphinx comprising many traces of multiple repairs, the current head being extremely disproportionate compared to the body. 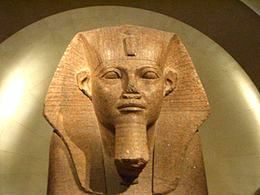 There is also a text of the Pharaoh Amenhotep II (1448/1420 BC) with a reference to the Sphinx as “older than the Pyramids.” Then we have the famous stele of Tutmosis IV which has led to my research on the second sphinx. It was generally accepted for long periods since the ancient Egyptians that the Sphinx was covered with sand, except for the head, until the Pharaoh Tutmosis IV (18th dynasty: 1420-1411 BC) cleared the sand from it. And we have the wonderful story of Tutmosis IV engraved for eternity on a stele of pink granite and erected between the paws of the Sphinx: it is known as the stele of Tutmosis IV. The Pharaoh who was not even yet a prince, not even belonging to the main lineage of Pharaonic succession, came to rest after a hunt in the shadow of the head only recently installed then, and fell asleep. There he dreamed that the Sphinx spoke to him in his sleep, begging him to rid him of his suffering because he could not endure anymore standing with the burning desert sand covering him. In exchange, he would give him the power and wealth. 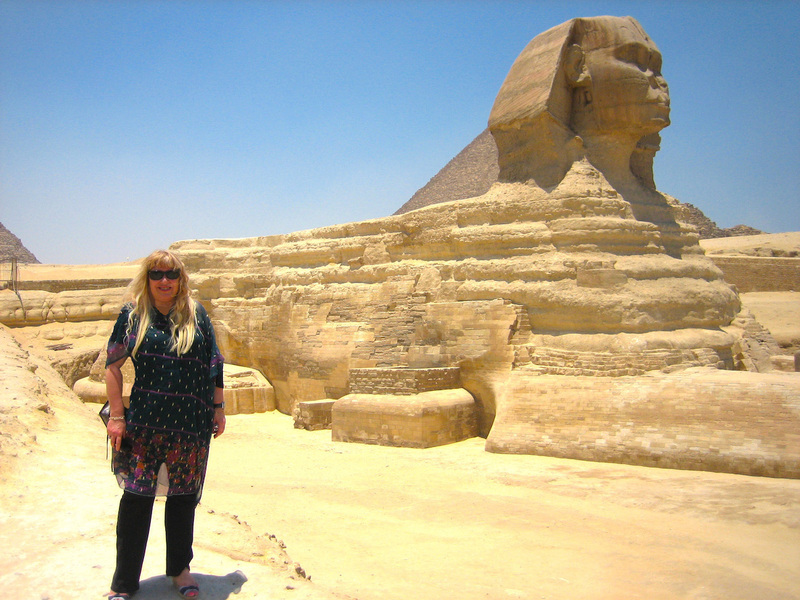 Then, I started searching in Egypt and thanks to my knowledge of Classical Arabic I quickly found texts confirming the existence of the two sphinxes. 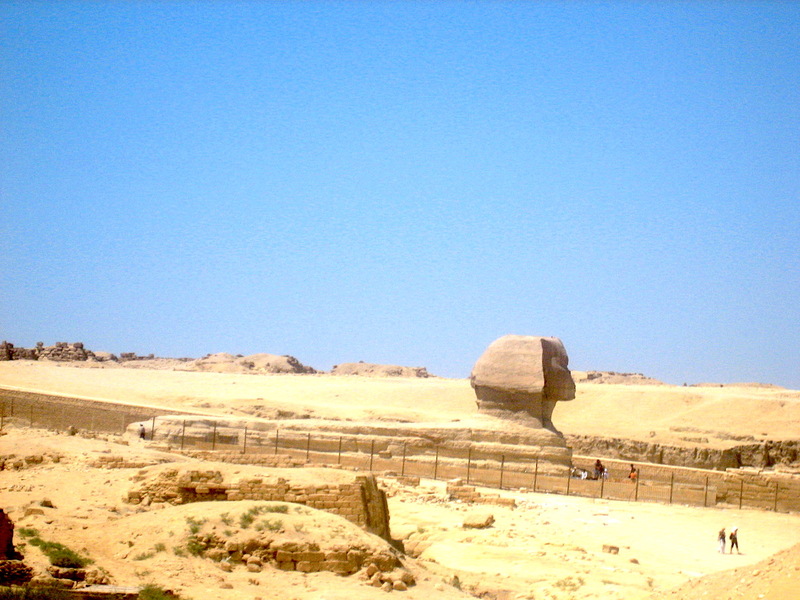 Thusly, two geographical encyclopaedias (Kitab Al Mamalik, Al-Mamsalik and Kitab Al Jujori, the great geographer, and Arab scholar Al-Idrisi [1099-1166]), mention well the presence of two sphinxes at Giza, one in very bad condition that is reached by the water of the Nile and has many stones missing. 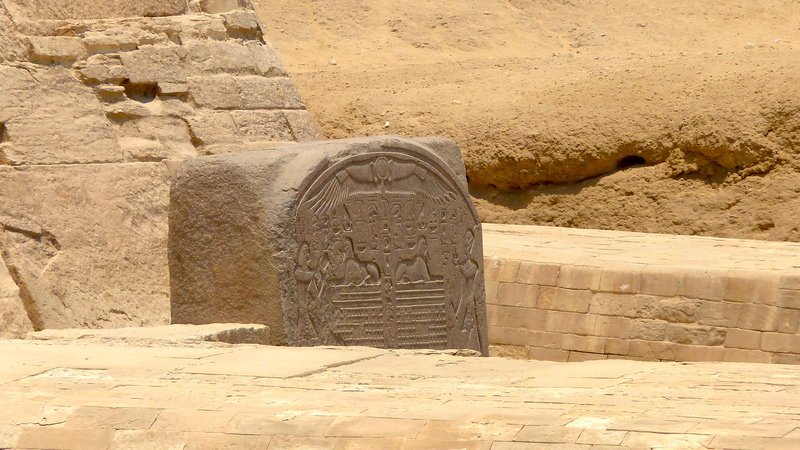 Other authors also mention the existence of two sphinxes: The celebrated historian Musabbihi wrote about a “sphinx smaller than the other” on the other side of the Nile, in very poor condition, consisting of bricks and stones (Annals of Rabi II, circa 1024). 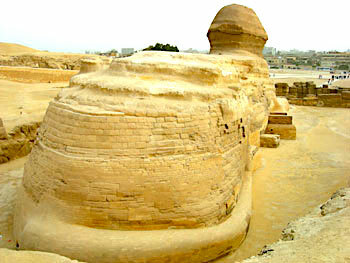 So I searched tirelessly for years for the location of the second Sphinx. 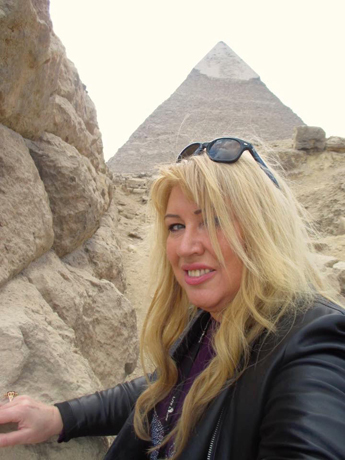 The task is very difficult because all the opposite bank of the Nile is covered with buildings of the megalopolis of Cairo and of its gigantic suburbs. 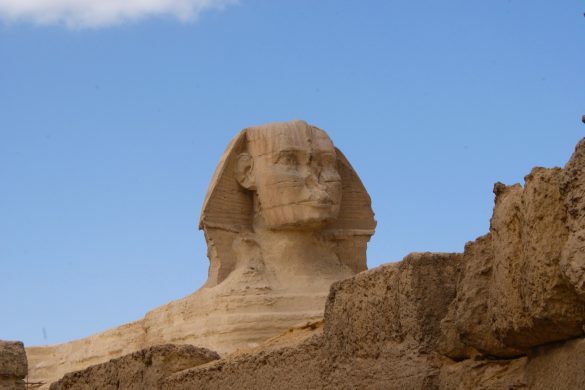 How to find the location of a missing sphinx? 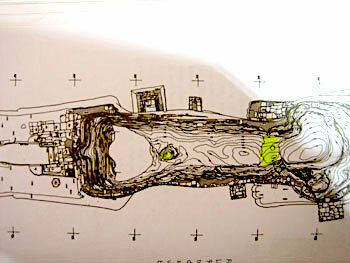 With a field study of the lesser details. After having traveled thousands of streets, I identified two possible locations. That’s when the great Egyptian geologist , Dr. Barakat paid me the honor of contacting me after reading my articles on this subject in English, to tell me that he greatly enjoyed my work and had arrived at the same conclusions, which as you can imagine, reassures me in the continuation of this research. I will share with you later our conclusions. Now I will focus on the use that was made – at least at certain times – of the Sphinx “Ankh-Sheshep”, “The Statue of Life” as it was called in the Middle Kingdom. This requires first that I should give you the most accurate report of what the Sphinx contains (here I would not speak of very small abnormalities detected by radar in the ground around the sphinx that for the moment have not led to any excavation) and this without speculation as it has been done in so many writings. And you’ll be surprised! 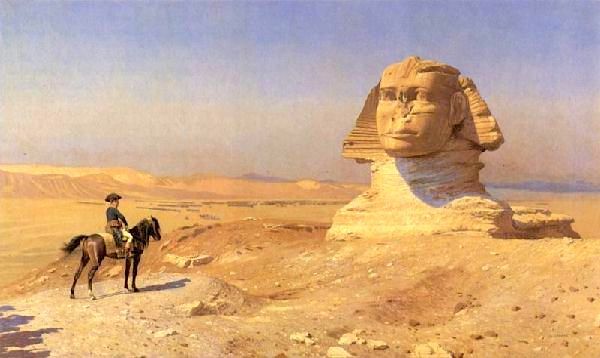 In fact, the reality is simply incredible and you will see with me that it has been a completely overlooked jumble of approximate information and disinformation that has obscured the Sphinx for a very long time. Indeed, if we were to make a thorough investigation, it would be complicated by the fact that many serious documents pass unnoticed, buried in silence, as if a desire not to show the truth is there, and one realizes that major discoveries have been made of which we have never heard. 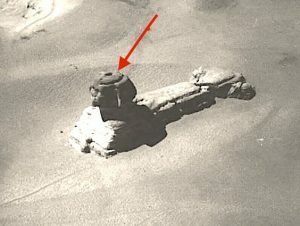 So, certainly, very few of you know for example that there are exactly three tunnel-wells in the Sphinx. 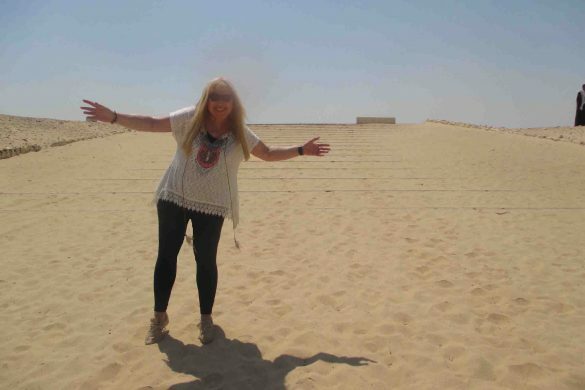 You have a tunnel dug at the rear of the Sphinx itself which is the best known one, another dug behind the head, and finally, the most overlooked which is located on the northern flank of the Sphinx. I’ll start with this one which illustrates well what is unspoken about the monument. The tunnel located on the northern flank of the Sphinx at ground level, was opened in 1926 by Emile Baraize who finally sealed it with cement blocks. There was even a door that Baraize walled with stones that he found at the time in the vicinity. What is amazing is that Baraize left no account of what he found and explored in this tunnel, he was so busy with his work of cleaning and restoring the Sphinx. Yet, two pictures taken in 1926 by Pierre Lacau exist (in archives at the Golenischeff center in Paris) of the interior of the tunnel, but even a scholar such as Temple had no right to see them! All that is known is that the tunnel is very old because its entrance is blocked by the collection of stones (beneath the stones of Baraize) from the earliest restoration. 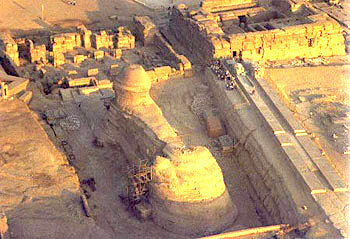 The Sphinx has undergone many restorations in effect in the past, under different pharaohs. And we wonder why we do not reopen this passage to see where it leads and to explore it as we should? A very great mystery! 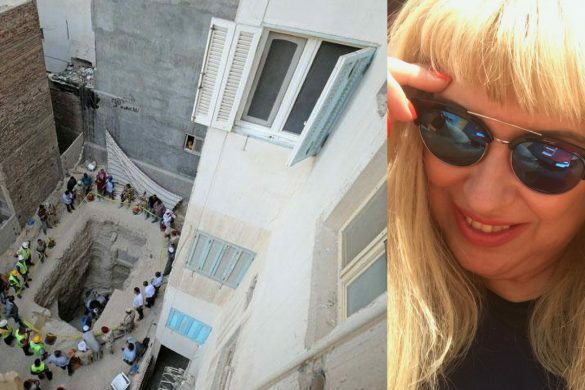 There was a conical and irregular hole 2m deep on top of the head (cemented since) that Coutelle had already seen during Napoleon‘s expedition in 1798 which had enclosed other elements of the headdress of the Sphinx. And then there is an interesting cavity whose entrance is covered by a sheet of metal (modern) that lies between the two legs of the sphinx. It leads to a small underground chamber on the vertical, where Henry Salt had walled (him too!) a subterranean entrance in 1817. Still another tunnel of which we know not today where it goes! 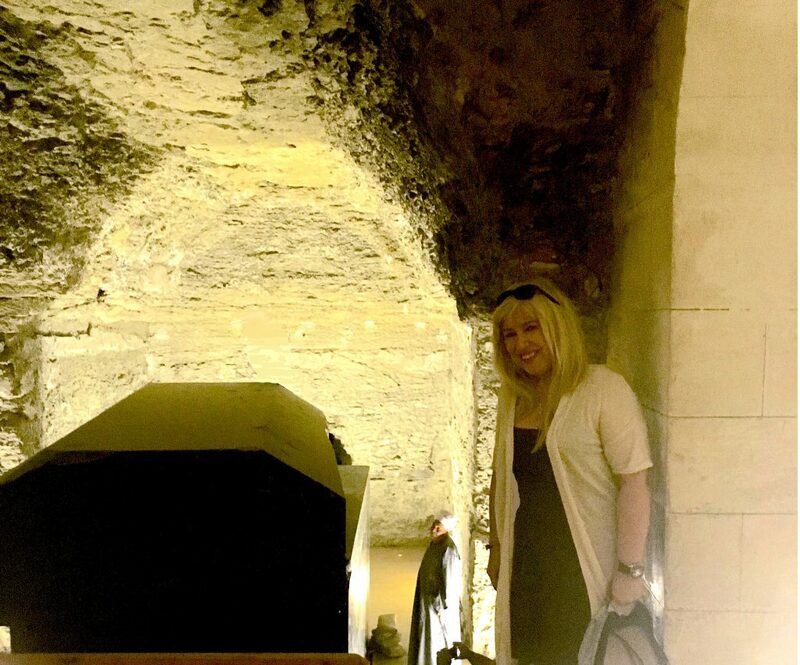 Many researchers think that this cave was used by a priest so that he could talk without being seen by the crowd and thus give an oracle in place of the Sphinx. 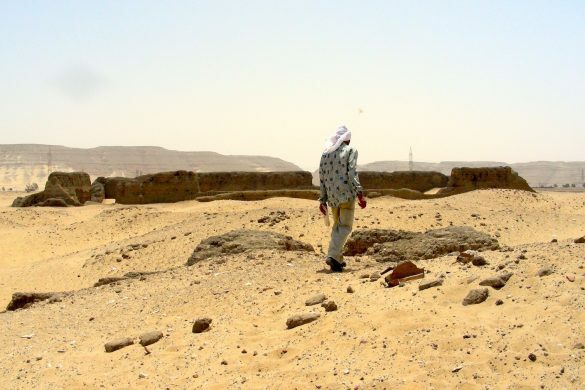 This oracular practice was widespread in the late Ptolemaic period where they tried to re-motivate the faith of people and we found in Fayoum (the fertile oasis of the pharaohs, 100km south of Cairo), many altars with secret rooms inside for this purpose. There may be a trail as Temple outlined in 1579 with the testimony of a traveler Johannes Heffrich who says that this chamber is a secret passage for a priest, without being seen, to go through a tunnel in the Sphinx’s head and talk to the crowd invisibly … We see anyway that the Sphinx still has many secrets to deliver even despite modern methods today. Hence, I’ve just told you of all of the known caves already explored in the Sphinx, but before returning to one specifically, to fully understand its possible function, I must speak first of the origin of the therapies and medicine of Egypt and especially of the leading character: the indispensable Imhotep, the one who claims that he built the pyramid of Pharaoh Djoser at Saqqara, around 2600 BC. Not only was Imhotep, whose name means “One who came in peace,” the prime minister of Djoser, the grand architect of the kingdom, High Priest of Heliopolis, Grand Magus and chief of all the priests of northern Egypt, but he was also a great doctor, probably the first with his own school of medicine and temple. 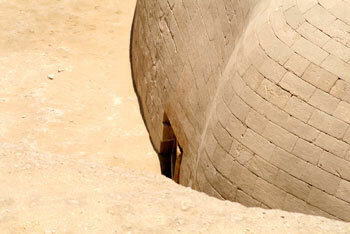 These buildings were located around the underground complex of the Serapeum, north of Sakkara. Also at Sakkara ancient surgical instruments were discovered. More than 2200 years before the birth of Hippocrates in Greece, still known as the father of our medicine, Imhotep himself, in Egypt, knew how to diagnose and treat over 200 diseases using anatomical terms of divisions and practicing surgery. We can find mention of this in the famous Edwin Smith Papyrus. 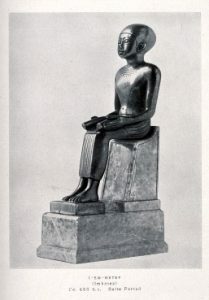 The great Egyptologist James Henry Breasted says of Imhotep: “In priestly wisdom, in magic, in the formulation of wise proverbs, in medicine and in architecture, this remarkable figure of Zoser’s reign left so notable a reputation that his name is not forgotten to this day.” In the Royal Canon of Turin recognized by Jean-Francois Champollion as a document of historical importance (“The Turin Papyrus” written in hieratic script and found at Thebes in 1822, of which remains 160 fragments that form a papyrus 170 cm wide and 41 cm high, now in the collection of the Museum of Turin), a list containing the names of Ramses II‘s predecessors, including the names of gods supposed to have ruled Egypt before the pharaohs themselves, we find the name of Imhotep who is designated as a “son of the god Ptah“. Along with Amenhotep, we have the only Egyptian mortal or “hybrid” who managed to attain the full position of a god. But what is interesting here is that later, when the Greeks settled in Egypt, the Egyptian Imhotep was equated with their god Aesculapius: Asclepius the god of medicine whose school of medicine was called Asklepieion. It is quite possible that both Aesculapius and Imhotep, are one and the same person as we shall see and as a great number of researchers already claim… But what else is said about Asclepius? We are told that he is the divine son of Apollo and a nymph Koronis-Arsinoe (Arsinoe is also the name of a place located south of the southern edge of the Giza Plateau at Fayum), so he is a demigod. We are told that he was raised in an underground cavern by the centaur Chiron (the last centaur on Earth according to the ancient Greeks), who taught him all about medicine and more … because Asclepius did not seem only to heal but he also raised the dead. The god Zeus, agitated by Asclepius‘ zeal to immortalize the land and thus disturb the established order of things, struck him with a blast of lightning and turned him into the constellation Ophiuchus (“the serpent holder”)… there is a teaching of the ancient Egyptians that when the the gods died they were transformed into constellations or stars. … The fact is that Ptah and Zeus are often associated with lightning. What is very important to remember, is how Asclepius cured; and mostly it was through the “incubation”, the common practice then of sleeping through the night or several nights in a sacred temple enclosure to provoke a dream full of meaning and consequently be healed. Either Asclepius appeared in dreams to the priests and revealed to them the remedies for their patients or patients themselves received them in a dream and were cured. Asclepius was portrayed with a stick upon which a snake is coiled, the symbol of medicine (not to be confused with the caduceus of Mercury, he with two snakes, symbolizing commerce and communication). A snake, for the oracular and medical functions of this medicine was also effected by the presence of a source of sacred water as we shall see, through water from out of the ground that with “the slow journey into the depths of the ground, allowed it to learn what was, what will be” said Rene Ginouvès in his remarkable work, and this water is symbolized by the “meandering” of the snake. 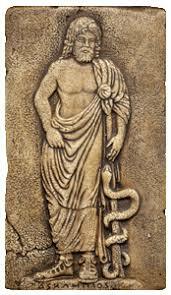 Asclepius had three sons and six daughters, including: Hygiene, Panacea and Meditina. 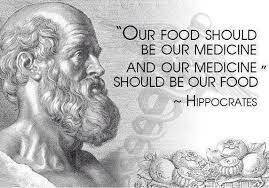 Note that our Hippocrates (the father of medicine, from whom we derive the oath our doctors take) is recognized as a descendant of Asclepius from his paternal side… It is to him we owe the words: chronic, endemic, epidemic, convalescence, paroxysm, etc., and though Western medicine invokes him, in reality, his conception of medicine was very different from ours. 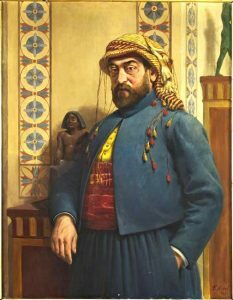 The Greeks were fascinated with Egyptian science and Homer (the Odyssey) informs us: “Egypt is the land of the most learned doctors of the world.” The medicine was not considered only an accumulation of knowledge and observation but also as a means of working on oneself to become a true channel of transformation. Besides their complex treatments with botanicals, surgery and fracture reductions, here is what constituted the bulk of their medicine: they were drinking water from an underground source and bathing their patients in the water because for them it was undeniable that the water carried along the healing powers of the spirits of the Earth. Then they took care of those who had courage and determination to undergo the treatments. Patients would be fasting and making multiple ablutions in the sacred precincts of what was called the Abaton, i.e., in the temple, caves and caverns below, where no one else was allowed to enter. Then, patients slept in collective dormitories of the Abaton for dreaming. There were proper dream incubation rituals where the deeper understanding of Mother Earth was supposed to send you dream guidance regarding the reasons for your malady and how to treat it. The next day you would tell your dream to the priests who would then prescribe you a treatment. They also said that the first image that came to the mind of the dreamer became a guardian spirit that never left. The lesson to be drawn from this study of dreams is very sophisticated. They did not practice a generalized interpretation of dreams; it was considered that one person’s interpretation of a dream symbol gave rise to different interpretations by different people. Each person was considered as having his own dream language and all work was done in accordance with the images and emotions of the patient. This science is called iatromantic incubation. The work of healing through dreams was well known to ancient Egyptians and for this I must take a moment to tell you about Bes. Auguste Mariette had indeed found a statue of Bes near the entrance of Serapeum. In fact, this spirit revered for its oracles at Abydos in southern Egypt, was also known to be oneiromantic. That is to say, it was also known to generate dreams that were then interpreted. Egyptians often placed its representation in the bedroom for their sleep to be populated with rich dreams. At the time, dreams were considered a very important means of therapy. Therefore, a caste of priest-doctors “the Wab“, apart from secular practitioners (“the Soundu“) who ran the country, lived in Houses of Life: Per-Ankh, at the temple to fulfill their dual function, priestly and medical. Most of the time they were doctor-priests of the lion goddess Sekhmet, and they practiced in the sanatorium of the temples, among other things iatromantic incubation on their patients. Disease was for them not considered as a divine punishment but rather as a rupture of the harmony between man and cosmos. 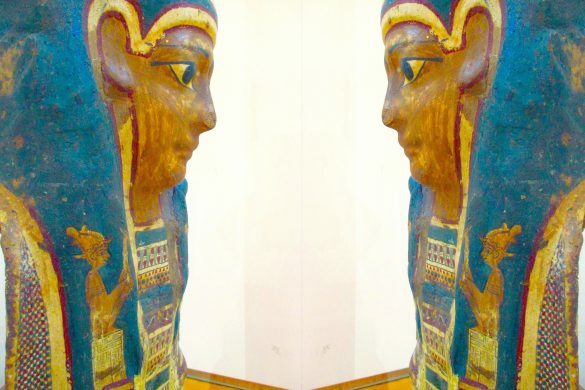 They were to restore the patient’s relationship with nature and harmony, well represented by the goddess Maat. That harmony was an essential value of Egyptian thought, which was required to counter negative forces, lies, injustice and the primal chaos from which the world was born. Maat was the guarantor of fairness and the overall balance of the world and this was taught in the temples by instruction. 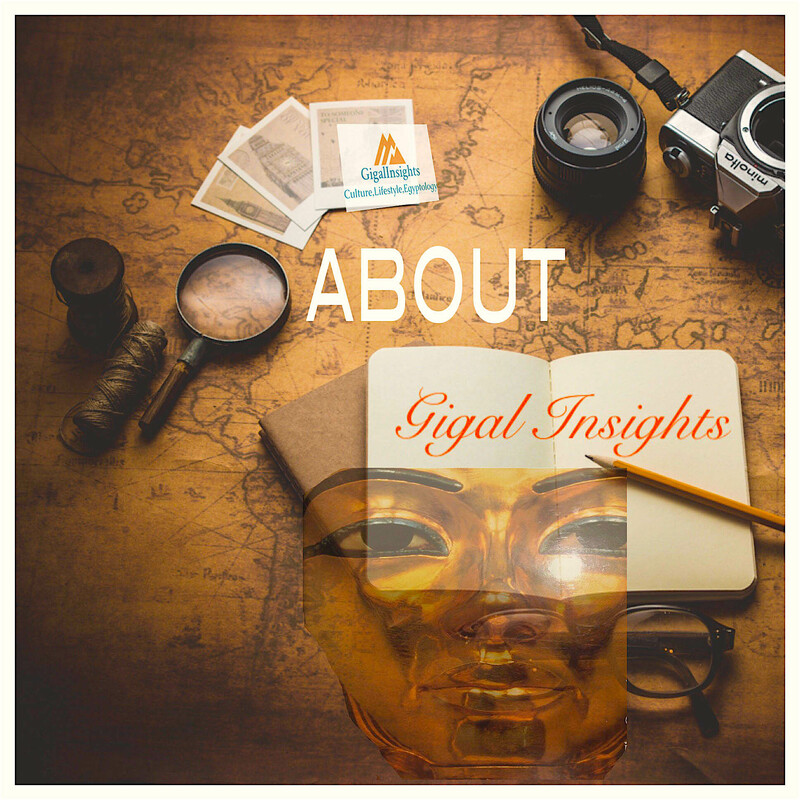 ©®Text, Photos ©®AntoineGigal-2018 Update of a Gigal’s article 2005 Copyright©2005-2018. All rights reserved. Tours, e-classes, surprises and much more ! * Selim Hassan (1887-1961): He is for me, one of the three greatest Egyptologists and archaeologists of all time. 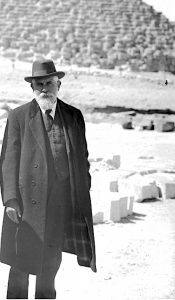 He tirelessly excavated at Giza and Sakkara from 1929 to 1937 and discovered many structures that are being rediscovered today and just wrote a extraordinary 16 volume “Encyclopedia of Ancient Egypt”. 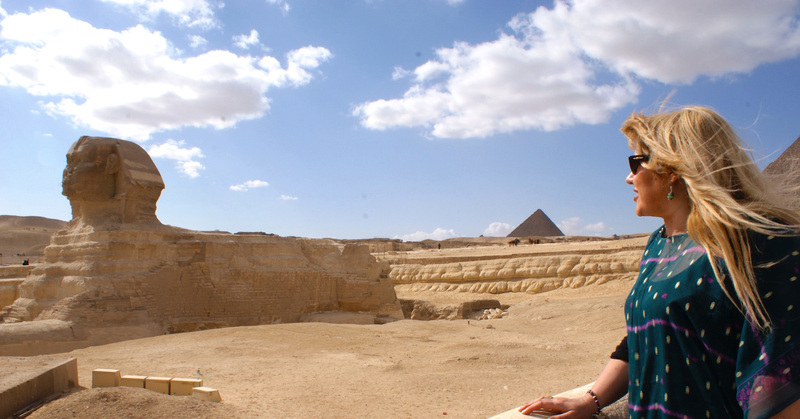 He’s published a total of 170 books on archeology in Egypt. **** Leto: The story of Leto as it is told in Greek mythology may rouse in us a strong interest in Egypt. Leto, daughter of Titans (powerful Elder Gods who ruled during the golden age under the direction of one of them: Cronos [Saturn] after his father Uranus [Heaven] for the first 21 generations of Titans) : Coeus, ruling over a celestial zone between the two terrestrial poles and Phoebe linked to the full moon and to luminous purification, and she became pregnant by Zeus. The wife of Zeus: Hera was so extremely jealous, she saw to it that “all land fled Leto” so that she could find no land on which to give birth. It is said that then Leto left Hyperborea for Lycia in Anatolia (country of the wolves, perhaps an old form of Anubis?) disguised as a she-wolf, and then went on to the island of Delos. There are several final destinations for the birth of Leto and experts are struggling to know which is correct. In any case she gave birth on an island that was not connected to the earth itself even under the sea, a floating island of some sort or an island “manufactured”. 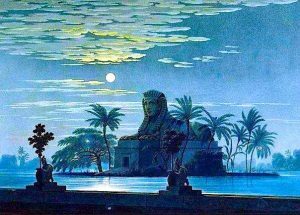 In Egypt, similar stories are told of Isis taking refuge on a floating island in the Nile Delta. 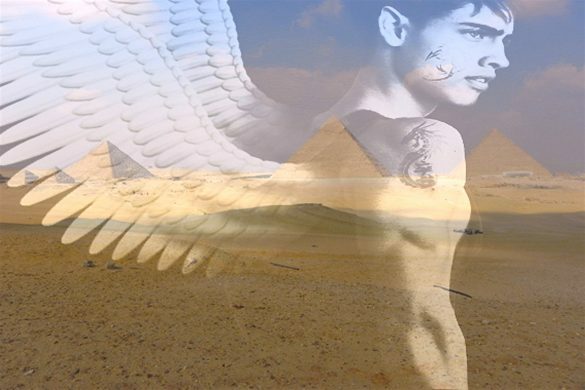 The Giza Sphinx with its island was indeed a place suitable to be linked to Leto. 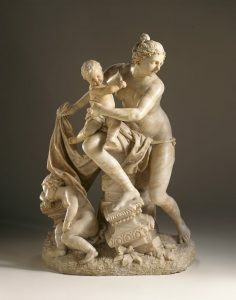 She struggled against many chthonic monsters and the Titans living underground and was attacked by Python before giving birth to the twins Artemis and Apollo. 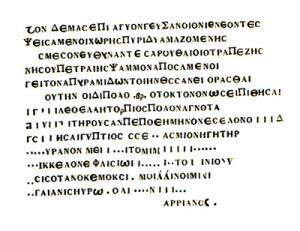 The Greek grammarian Antoninus Liberalis, a hundred years after Christ, tells us all this in great detail. He is the author of “Metamorphoses” a story about 41 metamorphic changes inflicted by offended gods). Note that Herodotus tells us that Leto was worshiped in Egypt in the form of the cobra goddess Wadjet, protectress of Lower Egypt. "The Passage Under The Sphinx",in homage to Jean Leclant, vol. 1 (Paris: Institute of Oriental Archaeology, 1994) by Zahi Hawass and Mark Lehner. "History of Divination in Ancient Times" by Auguste Bouché-Leclercq. "Incubation: or, The Cure of Disease in Pagan Temples and Christian Churches" by Mary Hamilton, London, 1906. "Operations Carried out at the Pyramid of Giza in 1837" by Howard Vyse, London, 1840. 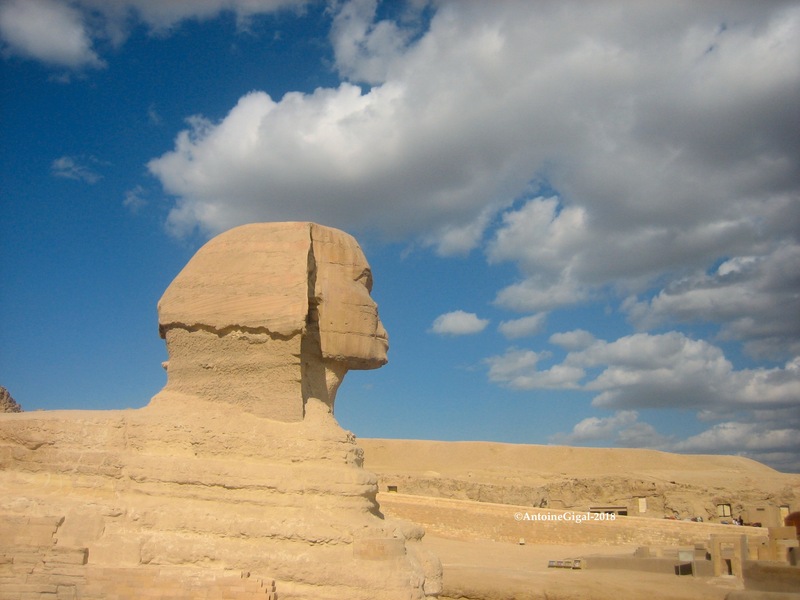 "The Great Sphinx and Its Secrets: Historical Studies in the Light of Recent Excavations" by Selim Hassan. Le Cairo, 1953. "Dieux guérisseurs et sanctuaires de source dans la Grèce antique" Lattes, 1992. "The Rod and Serpent of Asklepios, symbol of medicine" by J. Schouten, Amsterdam, 1967. "The Historical Library of Diodorus the Sicilian, Diodorus of Sicily.